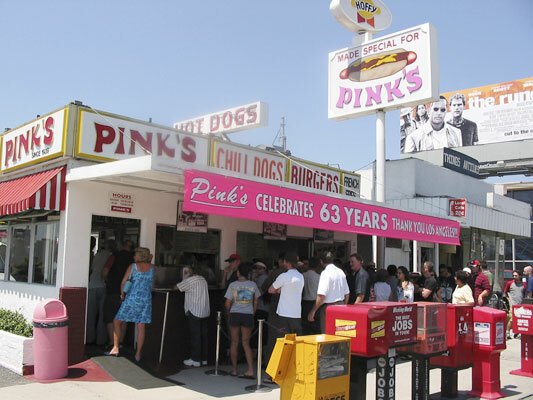 Pink’s Hotdogs in Hollywood has been a family-owned Hollywood institution since 1939. Located on La Brea Ave., you will rarely drive by this hot dog stand and NOT see a long line. It’s always packed with tourists to see what this famous hot dog stand is all about. I have heard many mixed reviews about this place. A lot of people actually don’t think it’s anything special. At least not what it’s hyped up to be, and my response……it all depends what you order. I’ve been to Pink’s many times, and have gotten it wrong many times. Everything I tried was just “OK”, nothing amazing that made me want to rush back. But when I decided to give it another try, I finally got it right. After waiting in line FOR AN HOUR, like, what was I thinking? lol, this is what I ordered and I won’t try ANYTHING else from this place. It’s a masterpiece. Ready??? 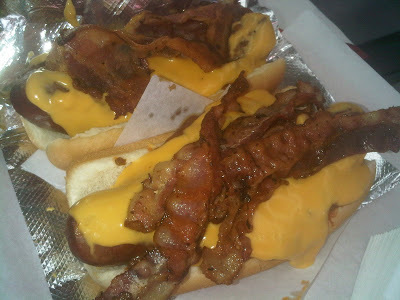 My Pink’s hot dog masterpiece is: HOT POLISH SAUSAGE WITH CHILI, NACHO CHEESE, & BACON. It’s messy and amazing. I use to go every Sunday at midnight (because the line wasn’t long), and the workers began to know me, and knew what I wanted to order before I even said anything lol. When I was feeling out of control, I would order a side of chili and nacho cheese, drive to McDonald’s down the street, order fries and make chili cheese fries. #DON’TJUDGEME. Anyways, I haven’t had Pink’s in a long time, but I shall return soon. If you do go, what I get is pretty epic. 709 N La Brea Ave. I like your style, Dirty!